I was so excited when I came home from work Friday to find that the heirloom garlic I ordered from Seed Savers Exchange had finally arrived. Above is Chet's Italian Red. The back of the card states "Highly productive and adaptable strain. Heirloom variety from Chet Stevenson of Tonasket, Washington, found growing wild in an abandoned garden along the roadside. A good garlic for eating raw, because the flavor is not too strong. Softneck, 12-16 cloves per bulb." 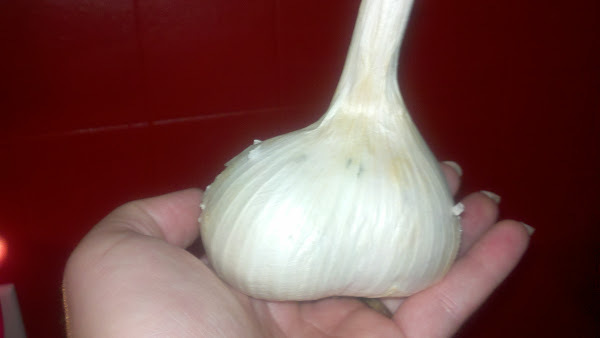 This is elephant garlic. Fitting name as the bulb is enormous. The back of the accompanying card states "Not a true garlic, but actually a type of leek. 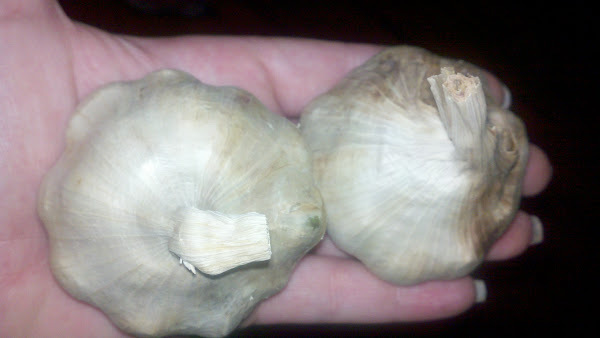 Huge cloves, and a much milder flavor than regular garlic. Bulbs have potential to grow 3-5" in diameter and up to one pound dry weight (WOW!) under ideal conditions. bulbs average 4-6 cloves." I'm waiting a couple more weeks to plant these and then will heavily mulch the area for winter. My garlic did exceptionally well this year and I can't wait to try these varieties. I still need to order mine, thanks for reminding me! I put mine in Oct-Nov here, so I still have time! Oh, I haven't ordered anything for the fall garden yet. Been pretty busy, but now I really need to get on it. Thanks for the reminder! The Italian red sounds interesting! I picked up a couple packs of garlic at the store when I went bulb crazy yesterday. Now to get them into ground. The garlic, not the bulbs. Well Erin and Dirt Lover, happy to help with the reminder. I think it is a little too early to plant mine but I have the space ready to go when the weather cools a little. Laura, I am excited to try the Italian red. I had to resist the urge to purchase more varieties than I did. I suppose in your area, it is just about the right time to get them in the ground. Wow! Those a pretty large garlic bulbs. I ordered garlic from seed savers as well, mine will be shipped in a couple of weeks. I won't put mine in until October sometime, after the frost. When do you do yours? I ordered elephant garlic as well. Gardenmom you have quite the variety! This is the first year i will be planting in the fall. My garlic did well for two reasons this year.1. The bulbs that i planted last year that did not come up decided to come up this year. 2. I planted my bulbs extremely early this year and they actually did much better than i thought. They would. I was going to wait for shortly after the first frost as well. I would love to see pictures of your when they arrive.